Ronaldo started playing competitive football for amateur club Andorinha when he was just eight years old, and then for local team CD Nacional when he was 10. He moved to Sporting CP, one of Portugal’s largest football clubs in 1996. Ronaldo trained in the youth team before making his senior debut in 1999 against Moreirense in which he scored a brace. He made his European debut in a Champions League qualifier against Inter. Ronaldo first gained international attention when he played for Portugal’s youth team in UEFA U-17 Championships. Liverpool, under manager Gérard Houllier back then, was reported to have interest in signing Ronaldo. It was also revealed later that Arsenal was closed to signing him before his move to Manchester Utd in 2003. Ronaldo’s signature came after Sporting defeated United 3–1 in a pre-season friendly. The United players spoke enthusiastically about the winger on their way home, and suggested manager Alex Ferguson to sign the player up, which he did for a price of £12.24 million. Ronaldo made a memorable debut for United as a substitute against Bolton; his 30 minutes performances created hype with United fans and the English media with his dazzling dribbles. He scored his first goal for the club with a free kick in a 3–0 win over Portsmouth in November. Despite promising starts, his first two seasons at the club received mixed reviews. He’s being praised for his technique and skill, but often criticised for lack of consistency and poor decision making on the field. Ronaldo made his senior debut for Portugal shortly after being signed by United in a match against Kazakhstan in August 2003. A controversy broke out in World Cup 2006 where Ronaldo was alleged to influence the referee to send off his United team mate and England striker Wayne Rooney in their quarter finals clash. Ronaldo was being used as the scapegoat for England’s defeat in the World Cup and the hatred towards him had prompted his intention to leave England and United. 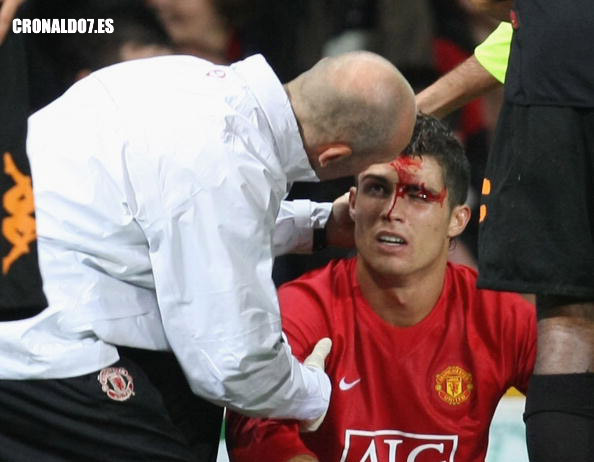 In the end United managed to keep him, and Ronaldo had a great season in the Premiership against all odds. Ronaldo won both the PFA Player and Young Player of the Year Award in 2007; he’s also voted Footballer of the Year by the Football Writers’ Association; and was the top 3 finalists for both the FIFA World Player of the Year and European Player of the Year awards in 2007. Ronaldo continued his fine form in the 2007/2008 season, netted in 42 goals in all competition (31 in Premier League), and was again voted as the PFA Player of The Year and Football Writers’ Footballer of the Year. His performance contributed to United’s double for the season; winning the Premiership in succession as well as bringing home the UEFA Champions League trophy, in which he scored a goal in the final. Ronaldo was crowned as both the FIFA World Player of the Year and European Player of the Year in 2008. 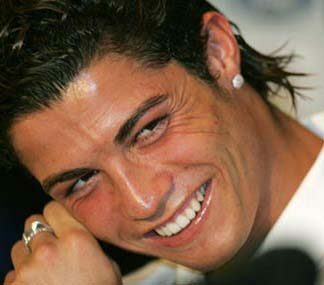 Ronaldo scored 26 goals in the 2008/09 season, helping United to another Premiership title, and again reached the final of the Champions League in which they lost to Barcelona. 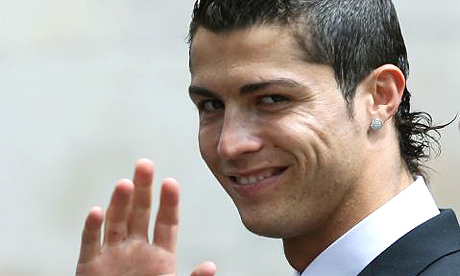 Ronaldo became the world’s most expensive football player following his move from Manchester United to Real Madrid in July 2009 in a £80 million transfer. He was welcome by 80,000 fans in the Santiago Bernabéu stadium during his official presentation. Ronaldo’s Real Madrid career started well and was in untouchable form until his injury in October. He recovered his form soon after and scored 33 goals in his first season for Real, but couldn’t help the club to win any trophies. Ronaldo captained his national team at the 2010 FIFA World Cup, but they were eliminated at last 16. Ronaldo broke the La Liga single-season scoring record by netting 40 league goals in 2010/2011. He helped Real to clinch the Copa Del Rey.